Amazon Publishing has purchased the rights to publish Christina’s book Never Stop Walking in five languages in 2018: English, German, Italian, French and Spanish. Sluta Aldrig Gå (Never Stop Walking in Swedish) was Christina’s debut book. It was published in Sweden in the fall of 2016, and a part of the revenue for each book sold is donated to Coelho Growth Foundation by Christina and by her publisher Bonnier. 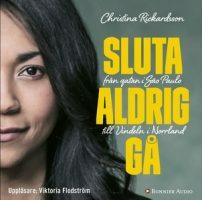 Christina Rickardsson’s autobiography was released as an audiobook in the autumn of 2016. The voice you will hear was lent by the talented Viktoria Flodströn. Click here to download the book as an e-book or audiobook. A pocket version of Sluta Aldrig Gå will be available in Swedish stores from 16/11/2017. Christina Rickardsson’s first book was published in Brazil in August, 2017. A part of the revenue generated by the sales of the book in the country will be donated to Coelho Growth Foundation, which was founded by Christina in the autumn of 2016. The foundation helps children that live on the streets or in orphanages in Brazil. Click here to read the first chapter of the book in Portuguese.